Not surprisingly, that tweet had a few third-party Twitter developers worried. While I dabble with both Brizzly and Seesmic Web, I still mainly use Twitter.com day to day, so the prospect of these new, more powerful features excite me. The reason I never got into one of the desktop clients is the same reason I only dabble with Brizzly and Seesmic: The lag in the API (and the rate-limit) annoys me. But that should hopefully change soon with the new Twitter firehose of data. Last year, Twitter added two huge new features to Twitter.com: Lists and Retweets. It’s hard to imagine what else they’re working on for the site now. One definite possibility is baked-in geolocation, which Twitter currently offers through its API, but not on the site itself. While new features are great, Twitter has to be careful not to make things too complicated. The core of Twitter has always been its simplicity — if you start tacking on features, that goes away quickly. That said, there is still room for improvement. Certainly, search is one area on the site that could use an upgrade with more options. The upcoming Twitter ads are thought to be built around Twitter Search, so it’s likely a candidate for an overhaul sometime soon. 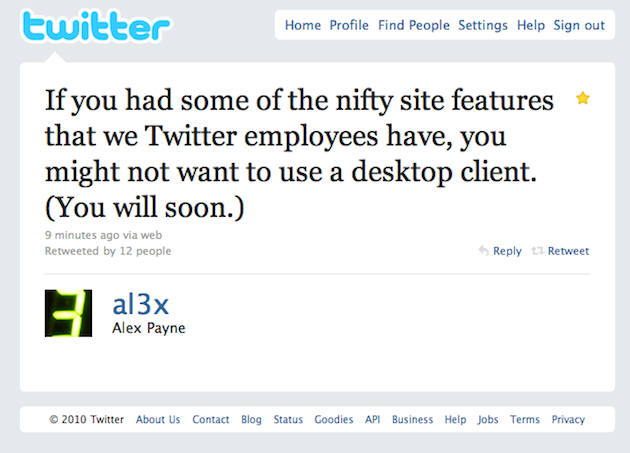 It’s worth noting that Twitter also recently hired a new UI guru away from LinkedIn. This was the guy largely responsible for LinkedIn’s nice iPhone (and other mobile platforms) app. Could Twitter be getting into that game too? And should third-party developers be worried by these moves? Twitter Lists in particular encroached a bit on what services like Brizzly were doing (though they now play nicely together). Any more encroachment and Twitter’s upcoming developer conference, Chirp, could be very interesting. Uh, everything I like that’s on the employees-only beta site is actually *built* on public API methods we’ve already given developers. I just mean that our web client team is building cool stuff. It’s going to inspire desktop app developers. Same data, new perspectives.